Sturdy, fully automatic cleaning device for one-step cleaning and degreasing. The HTW is made completely from stainless steel and powerful, easy and safe to operate and handle, and hence perfect for parts cleaning in service and maintenance, production and manufacturing. 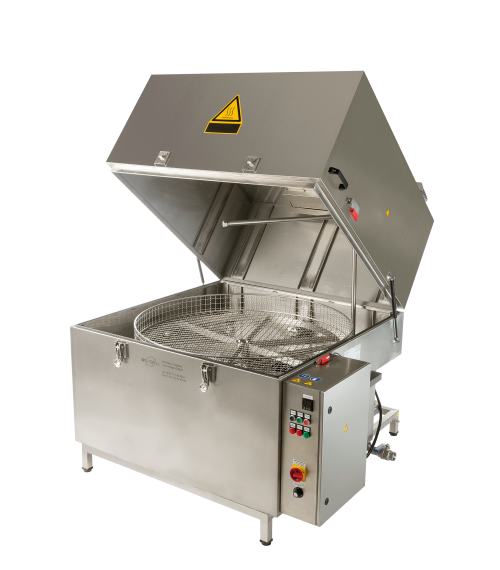 Due to the powered rotating rack and the spray pressure, the Bio-Circle cleaners in the hot-water parts washer have an optimal effect on the items to be cleaned. By adding the product Corrosion protection for water-based systems, also temporary preservation of the cleaned work pieces is achieved. The HTWs combine reliable quality with innovative technology. This can also be seen in the excellent cleaning performance, easy handling, low-maintenance technology and practical equipment components. They are available in three sizes: HTW II – 800, HTW II 1000, and HTW II – 1200.